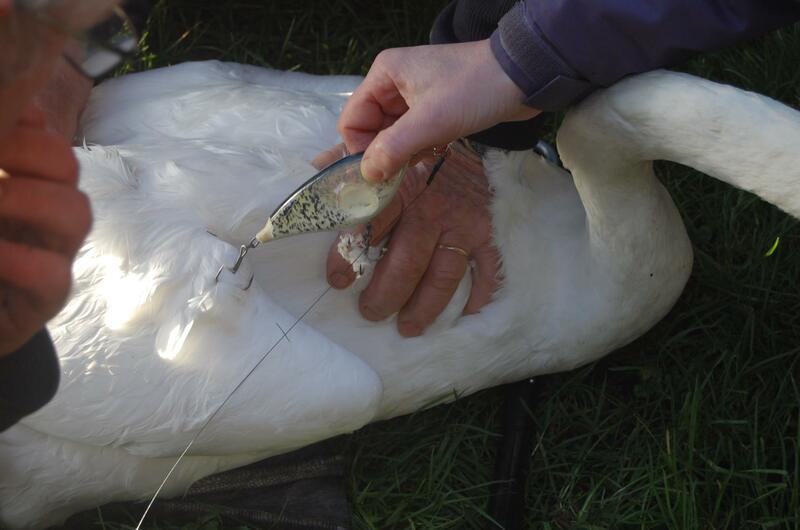 Swans and geese are finding themselves entangled in fishing line – sometimes with hooks attached – on an increasing basis, leading one local police department to urge anglers to dispose of line safely. The Point Pleasant Borough police department said this week that officers have responded to several complaints of swans entangled in fishing line with lures attached. The complaints have been in the south area of the Point Pleasant Canal as well as the lagoons in Bay Head Shores area. With early intervention, entangled birds can be helped before serious damage occurs, police said. They are urging local residents to report sightings of entangled birds to the proper authorities for assistance in capturing them. Residents can also save many avian lives by collecting and properly disposing of any fishing line littering the shores. “Please educate your fishermen friends, especially young children just learning the sport, to the dangers of monofilament line litter and the consequences to our wildlife,” the statement said. Many water birds also suffer from hook injuries when in proximity to fishermen, according to officials. It is a common misconception that hooks can be left in birds to disintegrate, as they are sometimes left in fish. Once hooked, fishermen often cut their lines and free the birds leaving the hooks embedded. These birds will need intervention and the hooks removed, experts say. They are usually carrying yards of line attached to the hooks which often gets entangled in branches or shrubbery and the bird faces a certain death.